Horse Temperament: Is your Yang Ming horse stiff? If there is such a thing as a perfect clinic then Remi and I just experienced one. Remi is a Yang Ming horse temperament and he has been in my life for 5 years. During that time we have worked to get his horrible feet better and help him trust that he was not going to be punished for not understanding something. As long as I have had him he has also been extremely stiff in all his joints. With all of Remi’s physical and emotional concerns, some of the clinics we have attended have been stressful for him. Despite the stress we have continued to get better together and last weekend we went to a clinic with Buster McLaury. My main objective was to help Remi be more balanced. When Remi gets nervous he pushes onto his front end and rushes. I wanted to help him shift his weight back to his hindquarters and slow down. Before I felt confident about asking Remi to shift back I wanted to make sure he was not still too stiff to do it without pain. 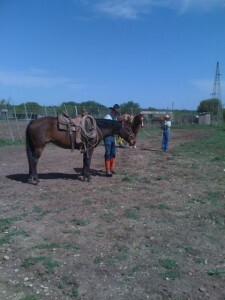 I had my good friend and trainer, Larry Hannon, watch me ride Remi before I went to the clinic. Larry felt Remi was trying to shift back but he was stiff in his left hind and he kept protecting that leg. Otherwise he felt Remi looked relaxed and supple. As a Yang Ming horse temperament, Remi will try to do whatever I ask even if he hurts but when he hurts he gets more anxious and rushes more. To help Remi with his stiffness I started him on Ani-Motion and doubled his chia seeds. I also gave him arnica each day of the clinic. Remi seemed to feel very loose and he was very happy throughout the weekend. He did get mildly chargy one day when we rode out as a group but Buster had helped me get my rein truly connected to Remi’s feet so I was able to slow his feet down and shift him to his hindquarters. Remi did all the exercises better than he ever has before. He was able to trot up, halt, back, and trot off without getting his feet stuck. He began to carry his head with some poll flexion and a loose rein. He was able to hold a 20 meter circle without drifting or pulling on the inside rein. I could tell he was really proud of himself and it felt so good to him to be able to do what I asked without discomfort. Looking for a new horse that is a better match for you? Currently listed on our Swap Page we have Yang Ming type hunter, Tai Yin trail horse, Wood ranch horse and a Fire sorting mare. Also a few young horses not fully typed but very cute. You can also see some of the other horses who have found great new homes where they can excel. This entry was posted in Cerise & Remi, Five Element Feeding, Five Element Personality Typing, Five Element Training, General Horse Care, Horse Health Care and tagged horse temperament on April 5, 2012 by Madalyn Ward, DVM.